Falling 16 Points behind Barcelona or dropping Iker Casillas for “technical” reasons. What was the bigger story for Real Madrid from La Liga at the weekend? The game against Malaga became something of a distraction when the news broke over the inclusion of Adan ahead of Casillas. Mourinho would have faced questions even with a win but the defeat simply intensifies the pressure. There were three changes to the Malaga team that won the Andalusian derby against Sevilla. Weligton, Iturra and Santa Cruz were replaced by Sanchez, Portillo and Saviola. Pellegrini opted to line up in a 4-3-1-2 formation which could equally adapt to a diamond in midfield with Isco at the point and Camacho at the base. Eliseu and Portillo moved wide. Mourinho made four changes to the side which could only draw at home to Espanyol. The main change was, of course, the replacement of Casillas in goal by Adan. Arbeloa moved to left back replacing Coentrao allowing Essien to come back in at right back. Modric and Callejon dropped out with Di Maria and Benzema coming back into the side. It was the customary 4-2-3-1 formation from Madrid. Malaga started this game well before Madrid provided more of a threat as the half wore on. Both Ronaldo and Di Maria spurned excellent chances for the visitors in the first half which they would later regret. Malaga took control of the game early in the second half. With clever movement combined with passing, Malaga always had a man available to pass to whilst Madrid became increasingly disjointed as the match wore on with some strange substitutions. The game demonstrated how Malaga have developed as a team under Pellegrini this season with defensive solidity and attacking creativity. Madrid, meanwhile, appear to have regressed under Mourinho this season looking increasingly like the side during his first season in charge when individual brilliance significantly outweighed the collective whole. Malaga goalkeeper Willy Cabellero is amongst the candidates for the Zamora goalkeeping award in La Liga this season. In addition to making a couple of excellent saves during the game, one of the reasons why he is in contention for the award is the form of the defence in front of him and Martin Demichelis. 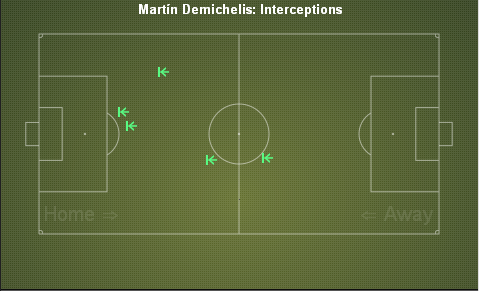 In addition to this, Demichelis was successful with both of his tackles and only one of his nine attempted clearances failed during the game. Pellegrini favours his side to hold a high defensive line and Demichelis leadership skills assist with this greatly. The only blot on an otherwise excellent defensive performance for Malaga was the two Madrid goals they conceded. The first goal was a bizarre own goal when Benzema clipped the ball off Sanchez foot. The second Madrid goal would have been equally disappointing when Camacho was dispossessed by Ozil who quickly chipped the ball to the Frenchman to score his side’s second goal. One of the reasons why Malaga enjoyed such a positive start to the second half and were the more dominant team throughout this period was the manner in which they attacked. With Eliseu on the left, Portillo on the right and Saviola as the central striker this enabled Joaquin to move across the pitch. Similarly, Isco also enjoyed the ability to move laterally across the pitch linking with both Eliseu and Portillo and creating problems for the Madrid midfield pairing of Khedira and particularly Alonso. Xabi Alonso is not the most mobile of players and does not want to be pulled wide. 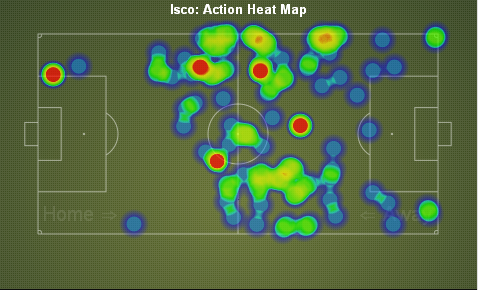 With clever movement, Isco was able to continually find space between Madrid’s lines. Isco made 49 successful passes from his 59 attempted and scored the opening goal of the game from his one shot on target. Initially marked by Pepe when a cross was delivered, Isco moved back out to the edge of the penalty area and collected Joaquin’s cut back before firing the ball low past Adan for the opener. The ease with which he found space was typical of his performance on the night. Mourinho made three substitutions in the second half. Trailing 1-0, Mourinho withdrew Arbeloa and introduced Callejon in the 58th minute. Just five minutes later, Di Maria was replaced by Kaka. The shape of the Madrid side was deteriorating as the second half progressed and these two changes created further problems. The final substitution saw Xabi Alonso leave the pitch to be replaced by Luka Modric in the 76th minute. At this stage it was now clear that Madrid would simply go long from back to front with nothing in the way of creative play. A move confirmed when Sergio Ramos went up front as an auxiliary striker from the 85th minute onwards. As the game drew to a conclusion, the TV cameras caught Casillas, Arbeloa and Alonso all sitting side by side on the bench. There is already speculation over why the latter two players were withdrawn. Whilst the removal of Alonso was surprising, given the effort he had already given in the game and the first part of the season, it’s perhaps not that unexpected. The replacement of Arbeloa by Callejon was the most baffling substitution. Whilst being designed for Callejon to push forward on the left, he was back by Malaga ’s attacks with Gamez moving forward and Joaquin drifting across to the right. Malaga took the lead from this area of the pitch. Meanwhile, Essien remained on the pitch and offered little. Why not switch Arbeloa to the right and withdraw Essien? Sergio Ramos – Good Egg? Mourinho recently commented to a member of the Madrid press that there were “three bad eggs” in the squad. Two of these “eggs” would be Casillas and Ramos. With Casillas dropped, Ramos took over the captain’s armband for the game. All the tackles came on the left side of defence. It’s worth noting that in the 58 minutes that Arbeloa was on the pitch, Ramos made two tackles in the left back area. When Callejon entered the game for the remaining 32 minutes, Ramos was increasingly called into action on the left and successfully made another four tackles. Sometimes though, it’s the stats that cannot be measured which are so important. The drive and determination shown by Ramos has been essential to his side. If Madrid are going to get back on form this season and challenge for the Copa del Rey or Champions League, the form of Ramos will be crucial. The Paraguayan’s first goal came via the right wing with Callejon badly exposed. Jesus Gamez had time and space to measure a low cross into the penalty area with Callejon slow to close him down and then standing off Gamez and allowing the cross. There had already been a warning over Callejon’s deployment at left back with Joaquin beating the makeshift defender with ease. Gamez delivered a low cross which Joaquin flicked goal ward for Roque Santa Cruz to tap in unmarked at the back post. Santa Cruz scored his second to give Malaga a two goal lead after 75minutes. Isco initiated a counter attack by playing a lofted pass to Joaquin on the halfway line. The winger progressed down the left, cutting inward before a deft pass released Santa Cruz on a cross over run and his low shot found a gap at the near post. By sharp contrast to Mourinho, Pellegrini made three clever substitutions. Leading 1-0, Saviola was withdrawn for Santa Cruz . The Argentinean had provided effort but little in the way of a cutting edge but his workrate had been valuable. Following the Madrid equaliser, and in a moment when Madrid threatened to take the lead and were in the ascendency, Pellegrini introduced the combative Iturra for the more attack minded Portillo to strengthen the central area of the team. Finally, with time running out, Seba Fernandez took the place of the tiring Joaquin. A move which helped eat up some previous seconds with the score at 3-2 and also enabled Malaga to have fresh legs to chase any long passes for the remaining few minutes. It’s difficult to examine the game without comment on the decision to start with Adan in goal. Leaving aside Mourniho’s comments that Casillas was dropped for technical reasons and that on current form, Adan is performing better. The question which must be asked why Mourinho would choose to replace Casillas in such a significant game for a relative rookie at this level? Despite Adan being 25 years old, this was just his 15th top team appearance for Real Madrid. There have been problems with Madrid defending set pieces this season with the accusation that Casillas stays on his line and fails to command his box. Whilst that may be true to a certain extent, a team defends a set piece as a unit. Teams may be scoring against Madrid but when the ball is delivered into the penalty area, it should be cleared. And with the number of goals that Madrid are conceding, Mourinho should be addressing these problems on the training pitch. The answer against Malaga was to pull every player back to defend corner kicks. This is not an efficient use of resources and also weakens one of Madrid’s key strengths; their superb counter attack. When a ball is cleared from the corner, there was no Madrid player waiting 30 or so yards from goal to collect the ball and instigate a quick transition. Instead, Malaga regained possession. The miracle of Malaga under Pellegrini continues. Despite losing key players in the summer and the ongoing financial problems which present obstacles to European football next season, the team march on. Whilst the defeat was another significant blow to the team, the challenge to retain their La Liga crown was not lost at La Rosaleda on Saturday evening. The title was lost on earlier trips to Andalusia this season with defeats at Sevilla and Real Betis. obtaining your ideas, but solid job anyway. I really should invest some time learning and understanding much more. Thanks for the article: I was looking for this info for my search.